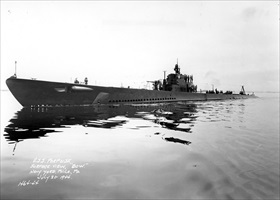 On this date in 1942 the USS Pollack made the first sub­marine attack using only its deck guns. Its tar­gets were two Japa­nese fishing boats. 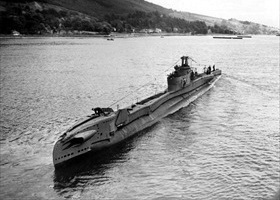 During 1942 U.S. sub­marines reported 34 gun attacks on sam­pans and trawl­ers. The num­ber of attacks in­creased to 64 in 1943, the same year a U.S. Seventh Fleet bul­le­tin put an offi­cial im­pri­ma­tur on sur­face gun attacks after launching unre­stricted sub­marine war­fare on Japa­nese ves­sels within hours of Japan’s devastating attack on the U.S. Pacific Fleet at Pearl Harbor, Hawaii. The July 30 bul­le­tin ad­vised that sub­marine gun­fire could be effec­tively used against junks, schooners, and other small ves­sels. Their sinking over the long haul, the bulletin advised, would produce impressive results. The Japanese, suffering mounting shipping losses to their mer­chant fleet, increas­ingly resorted to smaller craft to move per­son­nel, sup­plies, and even heavy equip­ment between Pacific islands and along their own coast­line. Pri­soners cap­tured from enemy junks con­firmed that the Japa­nese were using such craft to ship rubber, timber, tin, rice, tea, and shark liver oil, which was used to lub­ri­cate Japa­nese air­craft engines. Typi­cally owned by Chin­ese using a mixed crew of Chin­ese, Malays, and Indians, a 100‑ton junk might carry enough rice to feed 2,000 Japanese soldiers for three months. Many submariners felt that attacking fishing craft, and hence Japa­nese food supplies, was entirely justi­fi­able. When the sub­marine HMS Thule sank nine junks in a single day in Decem­ber 1944, its British skipper claimed his actions had destroyed enough rice to feed 5,000 Japa­nese troops for months. How­ever, some skippers believed these close-range sur­face gun battles were “just too much”—“intol­erably per­sonal” in the words of one sailor—and so they reluc­tantly engaged or declined to engage in these attacks. Whether to attack and sink these defenseless or lightly armed vessels remained a per­sis­tent dilemma, both moral and tac­ti­cal, through­out the war even as the num­ber of vessels sunk by deck guns rose. In 1944 the num­ber of small craft suc­cess­fully attacked by deck gun­ners aboard U.S. and British sub­marines climbed to over 300, jumping to nearly twice that many in 1945 before hos­ti­lities ended in August. By war’s end most large Japa­nese fishing vessels in South­east Asia had been destroyed in the context of “total war” against Japan. Left: The 300-ft-long USS Pollack, like the USS Porpoise shown here, had four forward and two aft torpedo tubes, one 4‑in/50 caliber (102mm) deck gun, and four 7.62mm machine guns. The Pollack conducted eleven war patrols. On her first patrol off the main Japanese island of Honshū in January 1942, the Pollack is offi­cially credited as having been the first U.S. sub­marine to sink a Japa­nese vessel, a 2,250‑ton cargo ship. On her last patrol she used her deck gun to shell the phos­phate plant on Fais Island in the eastern Caroline Islands in late-August 1944. The Navy conferred ten battle stars on the Pollack for meritorious service during the war. Right: In addition to 11 forward and aft torpedo tubes, the 276‑ft‑long HMS Thule was armed with one 4‑in deck gun and three anti­aircraft machine guns. In one twelve-day period between Decem­ber 17 and 29, 1944, the Thule sank thirteen junks, five sampans, and two lighters with gunfire in the Strait of Malacca, the narrow stretch of water between the Malay Peninsula and the island of Sumatra that connects the Pacific Ocean with the Indian Ocean. In 1945 the Thule sank a further five sailing vessels and three coasters.